I have been selling “Ferrule Shrinking Tools” again; they are used by bamboo rod makers to reduce the diameter of a female nickel silver ferrule and improve the fit. Since I have pretty well satisfied the total rodmaker demand for this tool, it is hard to justify ordering another large batch of parts from a machine shop. So I decided to make a few myself. The main structural parts are two aluminum disks, 2-5/8 diameter and 3/8 inch thick. The slabs are sawn from a 2-5/8 rod and have to be faced off with a lathe. I did the facing with my Minilathe because the Sherline lathe does not have enough low speed torque, making the operation very tedious. But the faces of the disks were coming out about .004 inch out of parallel. This would be OK for the purpose, but I felt that I should be able to do better. 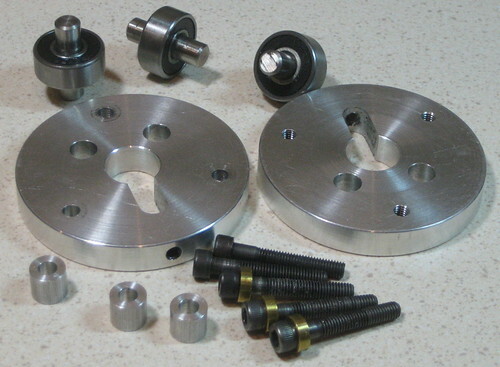 It is easy to see why the disks vary in thickness; the height of the three chuck jaws vary by a total of .004 inch. So the chuck jaws need a little adjustment. But these jaws are hardened and cannot be trimmed with lathe bits that I have. This a a job that calls for a tool post grinder. Not wanting to lay out money for the real thing, I decided to try my Dremel tool. Instruction on how to do this are on Varmit Al’s Mini Lathe Page. First step is to square up a Dremel-sized stone. I did this with a diamond point tool. Here is the grinding setup. The chuck jaws are clamping a scrap disk so that the jaw surfaces that I want to trim are at the right radius. The Dremel tool is held in a bracket that I made a long time ago for use with a Sherline mill. All 3 jaw surfaces have been colored with a Magic Marker. I turned the chuck by hand. Since I have removed the compound assembly in order to mount the Dremel tool, I have to advance the stone using the lathe’s rack drive. A dial indicator shows the carriage axial location. A clamp for the carriage is needed, also described by Varmit Al. I had to take very light cuts, about .0003 inch, or the Dremel tool would stall. But the final result was quite satisfactory. Thank you for sharing your great solution for a problem that you addressed with basic ingenuity, Great solution! For Dave, “good enough” is not good enough.